If you love the book World War Z, forget all of it when walking into the theater to watch the movie. Though the audience is treated to some clutch-the-arm-of-the-person-next-to-you moments, this was not really the point of the book. The movie is more about action and tension than the story most of us love. The movie begins at a very fast pace. After opening credits designed to build the apprehension among the audience, we meet Gerry Lane (Brad Pitt) and his family. After about three minutes of watching them peacefully get ready for their day, the action begins when the family leaves for a trip and havoc is breaking out in the streets of Philadelphia. People swarm the streets, and at first it is unclear what is going on, but Gerry witnesses a man attacked and infected with some sort of disease that takes over quickly and causes the infected to attack others. A former investigator for the UN, he instinctively does what it takes to get his family out of the city and on the road to New York where he can meet up with his former employer. They face many dangers on the journey – looting , more and more infected people, finding places to hide and food to eat. For the safety of his family – and against his wife, Karin’s (Mireille Enos) wishes, Gerry agrees to go back to the UN and track down the outbreak of this virus with the help of a genius epidemiologist. When plans break down early in their trek, it is up to Gerry to find the cure on his own. Along the way he travels from South Asia to Jerusalem and Great Britain. After helping up Israeli soldier, Segen (Daniella Kertesz), she becomes a reliable assistant in protecting him and continuing the mission. If it seems like that is a minimal description of the plot, it is because it is a minimal plot. There is just enough to propel the story from scene to scene, focusing more on the action sequences. As told by the epidemiologist at the beginning, Gerry must follow crumbs in order to understand how to tackle the outbreak, but because the director and writers focused more on building tension and some terror through chases and near death experiences, we are force fed the crumbs in short snippets before the answer is spelled out for us. Of course, the action scenes are really good and though not R rated, they are truly suspenseful without much blood or gore. When the high-speed zombies are chasing people through streets and buildings, it is easy to feel suffocated, wondering where the way out is. There are moments when zombies jump out or come close to biting someone that you want to physically help the person. Throughout, you are rooting for Gerry to make it – in spite of an eyerolling Pepsi product placement. Eventually, Gerry discovers not a cure for the outbreak, but a way to shield those not infected. When he tests the theory on himself, it makes his triumphant and completely safe stroll through a horde of zombies very satisfying, but it’s still not the same as the book. The book truly is better. The analysis of the crisis, the discoveries and the details about how they were made, the interviews and personal stories, all of it meticulously told as a case study. It’s the most interesting case study ever read, and still it instills a sense of foreboding in the reader. While reading the book, you could not help but imagine yourself living in the fear and the waste and the incompetence and the exhaustion that would actually come from a zombie apocalypse. And that is what is disappointing in the movie – there is no way this set up could really do the book justice. The best approach might have been something like a documentary that included flashbacks or recorded footage to tell of the past while they talked to those discussing the aftermath, but following one main character and barely describing the intricacies of what went on in the story leaves the movie somewhat hollow. 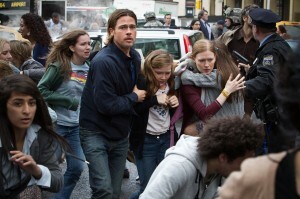 On its own, the movie World War Z, might work as a light zombie movie with effective thrills and scares but nothing we would expect to see actors like Brad Pitt in. 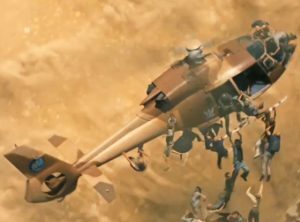 In considering the source material, there is no way World War Z lives up to the expectations created by the far superior book. This entry was posted on Friday, June 21st, 2013 at 6:33 pm	and is filed under Film, News. You can follow any responses to this entry through the RSS 2.0 feed. You can skip to the end and leave a response. Pinging is currently not allowed. « ‘Kon Tiki’ Star Takes The Villain Role in ‘Hercules’, Starring The Rock!! !